This year is the 40th anniversary of The Prince Edward County Community Care for Seniors Association. The organization will celebrate its long history of helping seniors live at home at a special event on October 12th, 2017 at Rotary Hall at the Prince Edward County Community Centre. As part of these celebrations, it is profiling some of the many people who have been instrumental in its development. Joyce Willard was born in Glasgow, Scotland immigrating with her family to Canada in 1953. She was eight years old when her family moved into a small upstairs apartment in Toronto across from some other recent immigrants from Italy. Her parents took shift work jobs to begin their new life in a new land. Her father worked in a factory that made chewing gum. Her Mom worked in a delicatessen from four to eleven PM. Joyce learned from an early age that you needed to work hard to make it in life. It was an important lesson. By 1971, she was a single Mom with three children aged six months, two, and four – and she needed to work. She got a job as a data entry clerk in a U.S.-owned electrical manufacturing company with a branch office in Toronto steadily rising through various positions in the warehouse department from driving a forklift to overseeing the installation of new equipment until her appointment as the first woman Operations Manager in the history of the company. As she neared retirement, Joyce also began volunteering to visit seniors in the community where she lived. Her first visits were with a retired schoolteacher who had lost much of his ability to speak. Over time she was able to understand him more easily and enjoyed the tests and lessons in geography and world politics they discussed during their weekly meetings. She took this experience with her when she retired in The County and began looking for other volunteer opportunities. 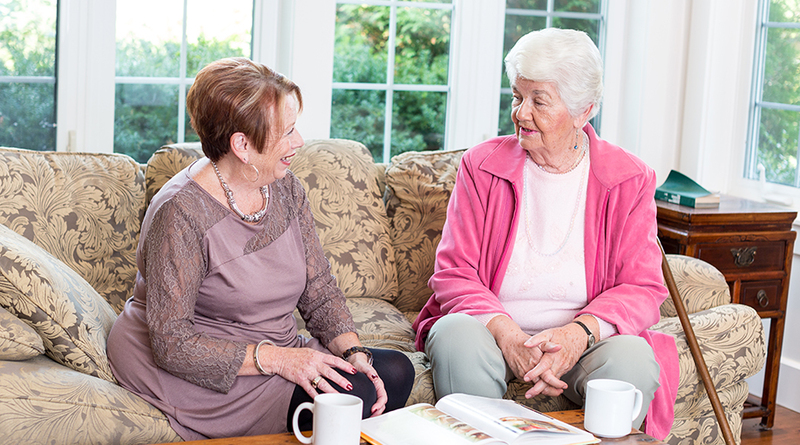 When her husband Bob died in June 2012, Joyce found staff and the other volunteers supportive and the work helped pass the times of loneliness. These days she can often be found one day each week as a receptionist at the foot care clinic or at the sales counter in the organization’s Thrift Shop on Picton’s Main Street. The passion for assisting seniors to stay in their homes and to live independent lives is still a big part of Joyce’s weekly schedule.